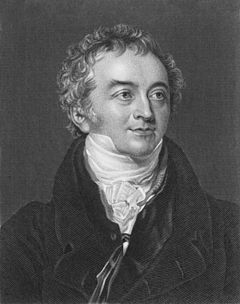 Thomas Young (13 June 1773 – 10 May 1829) was an English polymath. Young made important scientific contributions to many fields. His most famous work is on the wave theory of light. He also did good work to the fields of vision, solid mechanics, energy, physiology, language, musical harmony, and Egyptology. Among others, William Herschel, Hermann von Helmholtz, James Clerk Maxwell and Albert Einstein have praised Young's work. ↑ Cambridge in the Age of the Enlightenment: Science, Religion and Politics from the Restoration to the French Revolution (2002) by John Gascoigne, p. 278. This page was last changed on 19 February 2015, at 00:16.